In order to be successful the Internet of Things needs to be extremely inexpensive per node, and the problem is that most remote sensors are non powered by batteries, which either needs to be replaced or recharged, which involve maintenance costs. One ideal solution is battery-less IoT sensor nodes, that do not need any battery, and instead rely on energy harvesting. The idea is easier said that done, especially if you intend to do it cheaply. While there have been solutions provided over the years for example using vibration energy harvesting or water flow, battery-less devices are still not that common, but companies still bring new energy harvesting devices to market. One of those is Face International’s Evercell thermal energy harvester that leverages the temperature difference within a material to generate electricity, as long as ambient temperature is above absolute zero. The video embedded below shortly explains how the technology works. Face has partnered with BRIDG, an industry-led public-private partnership for advanced technologies and manufacturing processes, in order to further develop and manufacture the Evercell power cell. In the press release, we learn that an Evercell prototype has already been tested for 16 months with undiminished performance, and producing enough electrical output to power a typical wireless sensor. 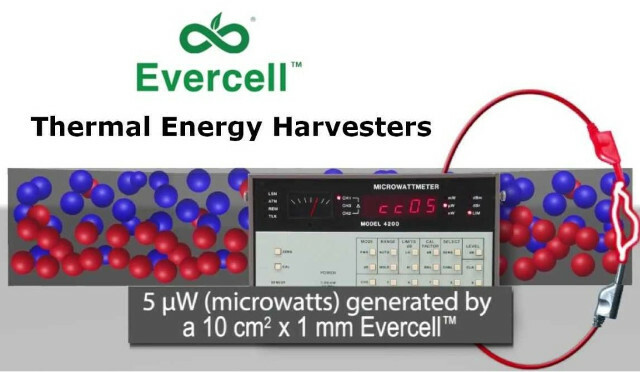 Furthermore, Evercell power cells are said to be “inexpensive to produce, consume no fuel, have no moving parts, and contain no toxic materials”. If the collaboration produces the expected results, mass production should start in 2019 at BRIDG facility located in NeoCity, Florida in the US. Further information may be found in Face’s Evercell product page.